As part of our space unit, we had the fun opportunity to visit a local NASA museum. The museum was small – nothing like the large NASA museum in Houston that I would love to take my kids to – but we still enjoyed a couple of hours there one afternoon. One of the exhibits my kids enjoyed the most was focused on life in the International Space Station. That exhibit included a glove box, which is a special box astronauts and scientists use to study (1) objects that may be harmful to humans if handled directly or (2) objects that may be damaged if touched directly by human hands. 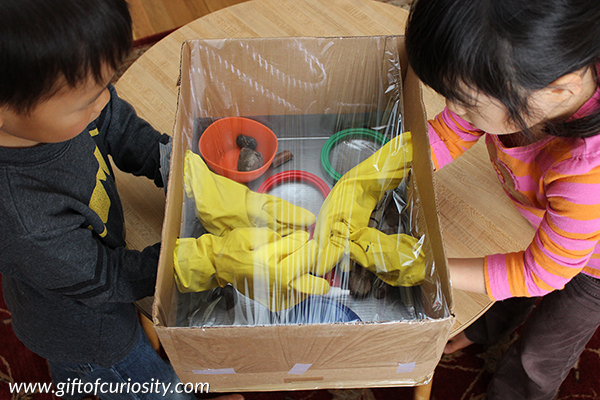 I wanted to give my kids a better understanding of the glove box and its role in scientific research. So I figured, what better way to help them understand the glove box than to build one of our own? Note: For more space-related activities, see my Space Unit Study page. 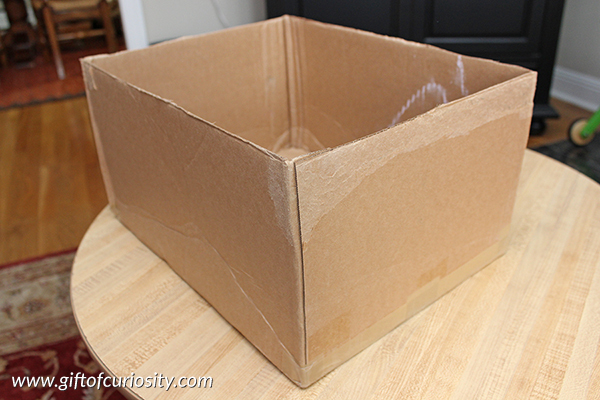 To build our glove box, we began by cutting the lid flaps off of a cardboard box. 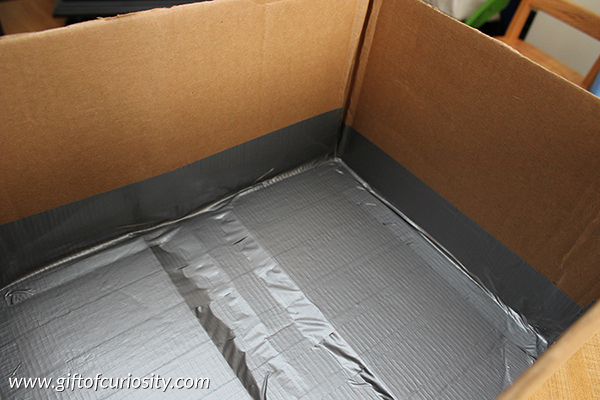 We then lined the bottom of the box with duct tape. We did this in anticipation of putting some damp materials into the box, but you can skip this step if you only plan to put dry items inside. 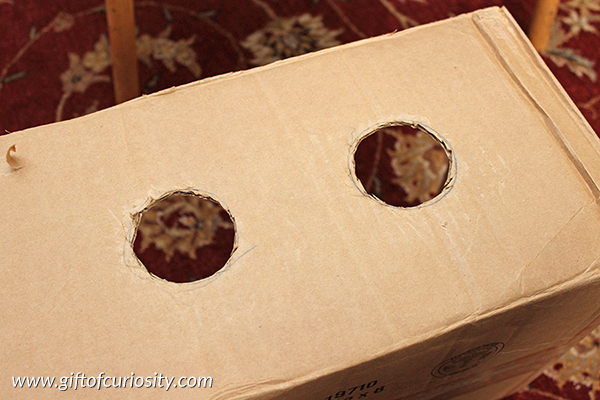 We then cut two holes on either side of the box. 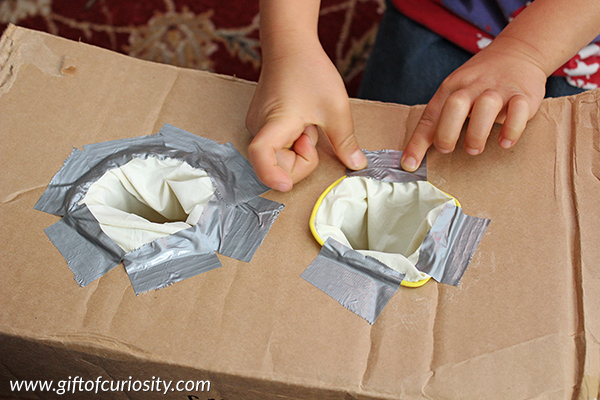 Make sure you make the holes large enough for your kids to fit their hands through. But you also want them small enough that you can tape your gloves to them in the next step. We placed the gloves through the holes we had cut, making sure to position them properly for little hands to be inserted into them. By this I mean you want to make sure to put the left glove in the left hole and the right glove in the right hole. You’ll also want to be sure you point the thumbs inwards and maybe slightly up so the hand position will feel natural when kids insert their hands in the gloves. 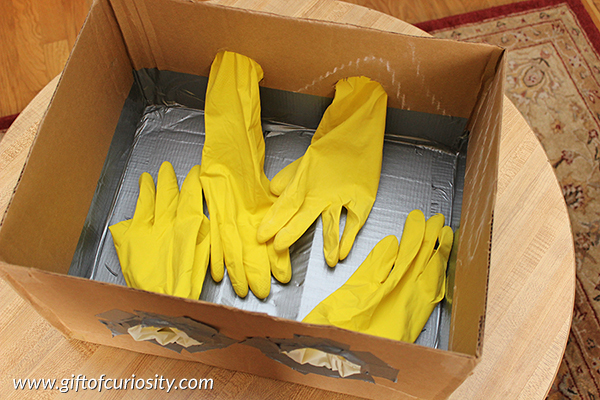 We used duct tape to form a complete seal on the outside of the box where the gloves went in. My kids and I talked about why having a complete seal was important to scientists and astronauts. This is what our glove box looked like once we had our gloves connected to it. 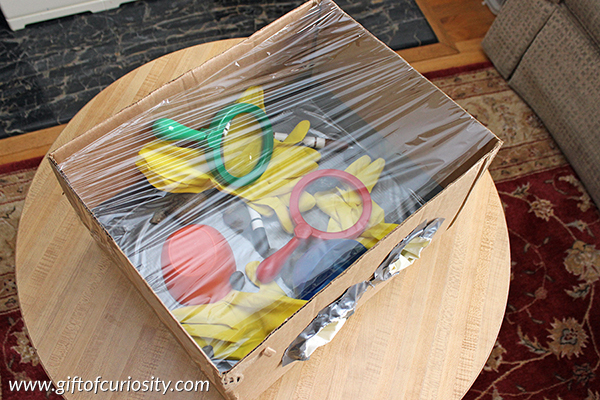 The last step to complete our box was to fill it with the objects to be manipulated and then cover it with plastic wrap so the kids could see what they were doing but not grab the materials except by inserting their hands into the gloves. In the picture below, I put rocks, markers, bowls, and magnifying glasses into the glove box. My kids and I pretended that the rocks were moon rocks, and I gave them the task of looking at the rocks, labeling the rocks, and then sorting the rocks into their respective bowls. They really took on the role of astronaut scientists very well with this activity, and had a lot of fun with it. They used the markers to make spots on the rocks, and began telling me that the rocks were contaminated with mold (even though they know that no such contamination was found on the real moon rocks). They were laughing so hard during this activity that I couldn’t help but smile. 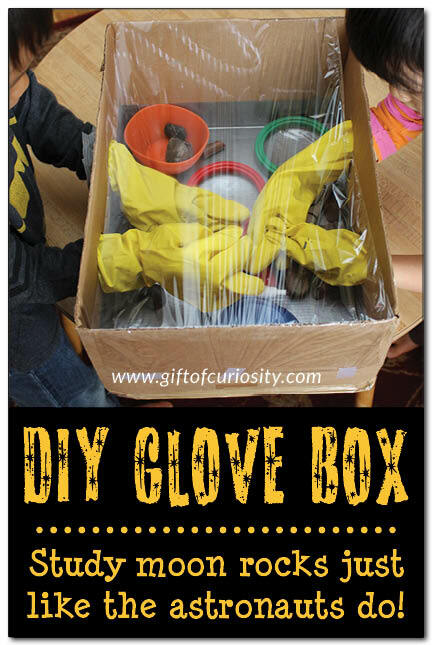 Building a glove box was a great way for my kids to learn more about how scientists works, and they got to emulate the astronauts who studied the first moon rocks back in 1969. You’ll find more resources for learning about life in space on my Space Unit Study page and my Space and the Solar System Pinterest board. Follow Katie @ Gift of Curiosity’s board Unit Ideas: Space & the Solar System on Pinterest. So glad you are finding fun ideas for your preschoolers! My kids would love this! Featured you on Mom’s Library this week! I made this for our classroom and it was a HUGE hit! Thank you! I’m planning to use this at our girl scout day camp. We are doing a Jurassic Girl theme. The girls will be pulling their dinosaur eggs from the Dino goo (orbeez), they’ll go into the incubator (glove box) to hatch, clean (in small bowls of water), and It will include a fan inside one end for drying the Dino’s!!! , They will then research what dinosaur they hatched. They’ll then make a “birth certificate,” the Dino’s in the eggs actually have a stamp on the bottom, so they can put their print on the certificate! They’ll follow up by making a”habitat” according to the need of their type dinosaur, including what kind of food they’ll eat!!! I cannot wait to do this!!! This sounds like a wonderful idea. I hope your girl scouts enjoy!